Sanjo Owariya is an authentic Japanese soba noodle restaurant. This is not your average chain restaurant but a place where you can still feel the old Japanese spirit live on. The noodles at this restaurant frequented by locals – tourists haven’t yet found this spot – are of course really good, with an especially rich-tasting broth, but the restaurant is something you have to see, and the owner is a personality in his own right. The restaurant is especially famous for their tempura soba, and for a good reason. The soba broth is divine. There is something special about the broth, a deepness you will be hard pressed to find elsewhere. The restaurant is conveniently located close to both Hankyu Karasuma and subway Karasuma Oike stations. The restaurant also sells cigarettes, and there is a rather prominent display on the left side of the front. But in Sanjo Owariya’s showcase you won’t only find cigarettes; you will also find Shrek, Snoopy, cute bunnies, and cats. I feel like this showcase in front of the noodle restaurant is not only a showcase; it is a window into the Japanese soul. It is only in Japan where noodles, Shrek, and cigarettes can coexist inside one restaurant. You will get a bowl of soba noodles with two shrimp fried tempura style on top. The shrimp taste great when crispy, but the batter dissolving into the broth is also surprisingly good, so good in fact that I recommend you eat one shrimp first, but leave the other one for later. But the real star here has to be the broth. The broth has a really deep taste with a bit of citron there as a subtle, somewhat hidden flavor. Often when eating soba noodles you need to use the Chinese soup spoon, or renge, to really taste the broth properly. Not at Sanjo Owariya, you get the taste of the broth entwined with the noodles. This is a feat that is easy to do with ramen, but not so easy to with soba. The strong taste of ramen sticks to the noodles easily, but the more refined taste of soba is a harder task. This is why I am already planning on going to Sanjo Owariya again; the broth is something you cannot taste elsewhere. This curry nanban is curiously for Kyoto named nanban, not nanba like it is usually named in Kyoto. The curry nanban at Sanjo Owariya has a rather sweet taste that is intensified by the sweetness of the “oagesan” deep-fried tofu in the dish. The taste is sweet and very Japanese; this is no modern Indian variation of Japanese curry. The traditionality of it all is what is good about it; even during these tumultuous times this gentle curry will make you feel at home, safe and secure. Japanese curry is something you should not look down on just because its taste is not that strong. The traditional sweetness of it is quite charming and also goes really well with shichimi spice mix. You might have heard of kitsune udon, udon noodles with a deep-fried tofu on top. It is not often that you get to see kitsune rice bowl on the menu, at least this was the first for me. And what a bowl it was; a testament to the Japanese skill of bringing out a deep taste out of simple ingredients. This makes a great addition to the noodles in case you are really hungry. The sweetness of the deep-fried tofu goes really well with the spiciness of the shichimi spice mix, which in Sanjo Owariya is in a quaint little container that looks like it has been in use for some time. 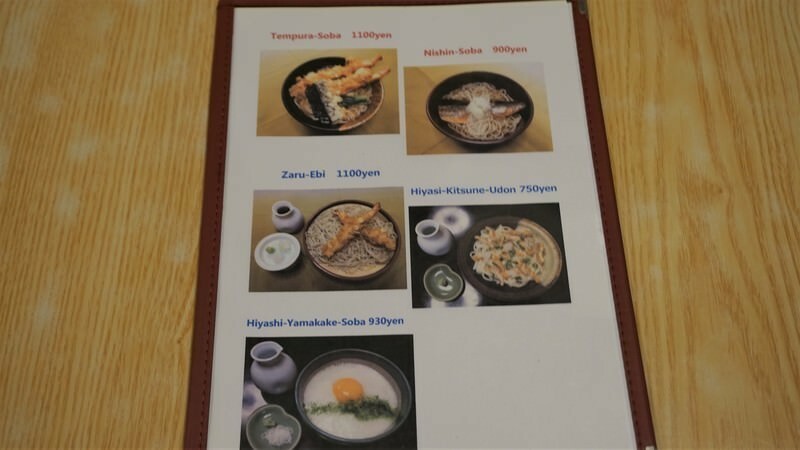 Sanjo Owariya has a menu in English with pictures so ordering is easy even if you don’t know a word of Japanese. You can choose between hot and cold soba noodles. The cold zarusoba noodles are handmade which makes the choice between hot and cold soba a pickle, but the broth is so great that I have to recommend the hot soba. I have been to many soba noodle restaurants in Kyoto, but Sanjo Owariya is my favorite! What I found interesting was that I liked their normal hot soba even more than I did their curry soba; usually I prefer curry. Their soba broth is so perfectly seasoned that I didn’t even feel the need to add the chili shichimi spice mixture to the noodles, which I also normally do. A remarkable restaurant, close to subway Karasuma Oike and Hankyu Karasuma stations, but still a bit hidden in an alley. This is a soba noodle restaurant bustling with locals! There are many patrons slurping noodles even during weekday lunchtime so be prepared to wait. They are famous for their curry soba. The soft soba noodles embrace the mild but spicy curry… it’s really yummy! The restaurant is a 5-minute walk from subway Karasuma Oike station so it is easy to get there. 5-minute walk from subway Karasuma Oike station, 10-minute walk from Hankyu Karasuma station. Monday to Friday 11 a.m. to 7 p.m. Saturday 11 a.m. to 4 p.m. They have a menu with pictures in English so ordering won’t be a problem. Communicating can be done via gestures.